Sunder mundriye..., bonfires, peanuts and gachak. Lohri, which usually falls on January 13(Pausa) every year, is more than just a festival. It is about fun, celebration and the coming together of all, big and small. CHANDIGARH, Jan 12  What can be the result of the amalgamation of instant food and MTV cultures? A new kind of Lohri in which the only thing from the tradition is lighting a bonfire. Lohri is just another occasion for friends to dress up and get together at night and have fun. What is fun? Eat, drink and dance. Sunder mundriye..., bonfires, peanuts and gachak. Lohri, which usually falls on January 13 (Pausa) every year, is more than just a festival. It is about fun, celebration and the coming together of all, big and small. The day begins with children collecting money from houses in the neighbourhood. In the evening, winter savouries are served around a bonfire. Celebrated enthusiastically in Haryana, Punjab and parts of Himachal Pradesh, it also signifies the beginning of the end of winter. Children go from door to door singing songs in praise of Dulha Bhatti, a Punjabi version of Robin Hood who robbed the rich and helped the poor. These "visitors" are given either money or gachak, bhuga, til, moongphali, gur and rewri. A bonfire is lit and everyone gathers around it. Munchies, collected from each house, go around the party and are also thrown into the fire. The festival assumes greater significance if there has been a happy event in the family during the elapsed year, like the birth of a male child or marriage. The family then plays host to relations and friends wherein the eats take a back seat and merry-making takes over. Move on folks! It is then time for bhangra, dhol, gidda and light-hearted flirtation. Liquor flows freely and guests are served dinner. But then liquor is a modern introduction and is not customary and celebrations depend on how much does the pocket allow. A popular belief in this region is that if someone seeks a radish roasted in the bonfire lit by a family that has reason to celebrate, then blessings are bestowed on the family of the seeker as well. Geographically speaking, the earth leans towards the sun along the Tropic of Capricorn (Makara rekha) from the day following Lohri, also known as Winter Solstice. The earth, farthest from the sun at this point of time, starts its journey towards the sun along its elliptical orbit, thus heralding in the onset of spring. It is this transition which is celebrated as Lohri in northern India, Makara sankranti in the central part of the country and as Pongal-Sankranti in South India. The festival is spread over three days in South India and also signifies the beginning of harvesting. A rath yatra is taken out from the Kandaswamy temple in Chennai on Pongal. The day is celebrated as Ganga-Sagara in West Bengal and according a belief, Hindus purify their sins by taking bath in the Ganges. A big fair is also held on the Sagara Island, 64 km from the Diamond harbour where the Ganga meets the Bay of Bengal. Call it Lohri, Pongal or Sankranti, the festival conveys the same message -- the bond of brotherhood and the spirit of oneness should prevail despite all odds. CHANDIGARH, Jan 12  What can be the result of the amalgamation of instant food and MTV cultures? A new kind of Lohri in which the only thing from the tradition is lighting a bonfire. Lohri is just another occasion for friends to dress up and get together at night and have fun. What is fun? Eat, drink and dance. With a slight difference from the normal `fun time'-- in the eats, the menu is mainly roasted groundnut, pop corn and an assortment of the sugar/ jaggery and til/ dry fruit concoction called gachak and reori and bhugga. And dance is around a bonfire. Venue?  Could be home or a club. If it's a club, great. Then you have to do nothing. Just go there and most club managements would provide you with the necessary entertainment, maybe even at a discount! No problem if you don't have access to one or even if you live in a colony of the concrete jungle called flats. After all, it's festive time. You have the licence to get together and light a fire in the middle of the road or a community park, put on the stereo at a blasting volume and get on with it. What? Neighbours, you said? Well ! Can't help it. If they don't wonna have a good time, not our fault. We want to. This stance leaves the older generation and the middle one, which is neither here nor there, with little choice. They can only remember the "good old days when Lohri generated warmth from not only the bonfire but also the camaraderie developed by friends, neighbours and relatives beating the chill by the warmth of togetherness." Neighbourhood children singing "Sundar mundariye....." and collecting items from door-to-door is increasingly becoming a rarity. Only in case of the "first Lohri" after a birth or a marriage in the family is the festival celebrated in households. Then, too, it is a somber affair. Not the sound of music of pop stars Daler Mehndi, Jasbir Jassi, Jojo, Phalguni etc. drowning the exchange of family gossip for them. Come to think of it, perhaps, one of these musicians could actually come out with pop a "remix" of the "Sundar mundariye........ Hukka bhai hukka.... Lohri do ji lohri.." rap and keep the culture alive in a way that the youngsters understand and relate to. Look at it either way, traders are having a good business ( though they claim otherwise ) and to get premium quality bhugga, costing over Rs 100 a kg, you may have to stand in a queue or as it happened at a leading Sector 34 sweetmeat shop today at 12 noon-- "Please come again at 3. The morning stock is finished." 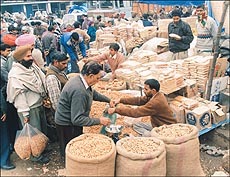 Shopkeepers have put up stalls to sell the Lohri items and people are buying by the boxful. The Sector 2 6 Grain Market is full of the stuff, available at much cheaper rates than your own sector market. Groundnut that you normally get for Rs 40 per kg can be had at less as Rs 20 to Rs 35 in Sector 26. Wood for the bonfire can be bought from the Timber Market at Rs 1.50 to Rs 2 per kg. While til, gur and nuts provide the much-needed warmth, don't over- eat. They are fattening. Alternatively, compensate with a walk or jog the next day. Brush your teeth or at least rinse your mouth every time you eat the sweets. Be well-clothed. Prevent exposure and avoid going to a cold room suddenly after sitting close to the bonfire where the temperature is high. You may catch a chill. Some people are allergic to the smoke of coals. So, it's better to use only good quality wood for the fire and if possible, dung cakes.